Pierre Simon and Etienne Pajeot were, in my view, the two finest bow makers of the classic French school in the period after François Xavier Tourte and his followers. They were among the group of makers born near the end of the 18th century or in the early 19th, who created bows with full heads, often the hatchet type, and, broadly speaking, generous sticks. 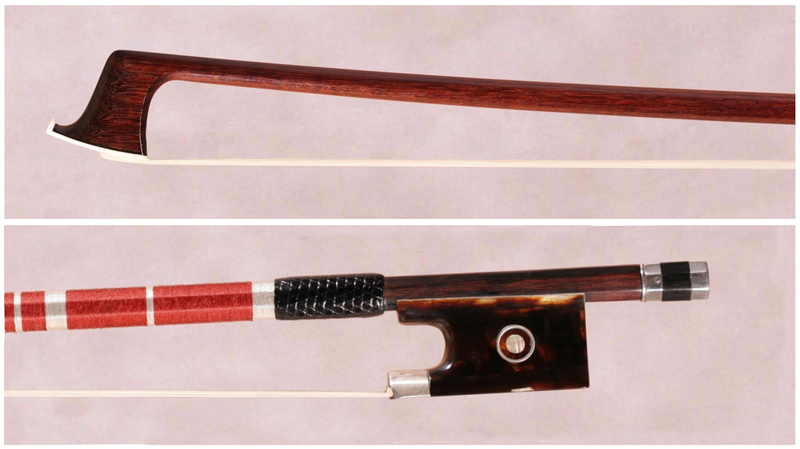 This type of bow dominated the French production until the advent of François Nicolas Voirin and his different concepts around 1870–75. Although Pajeot (1791–1849) died at the rather young age of 58, Simon (1808–1881) lived a much longer life, probably working till near the end in 1881 at the age of 73. Like many bow makers, the technical quality of his work declined in his later years, this being most noticeable in the frogs and buttons. But the three bows featured here show Simon at this best. 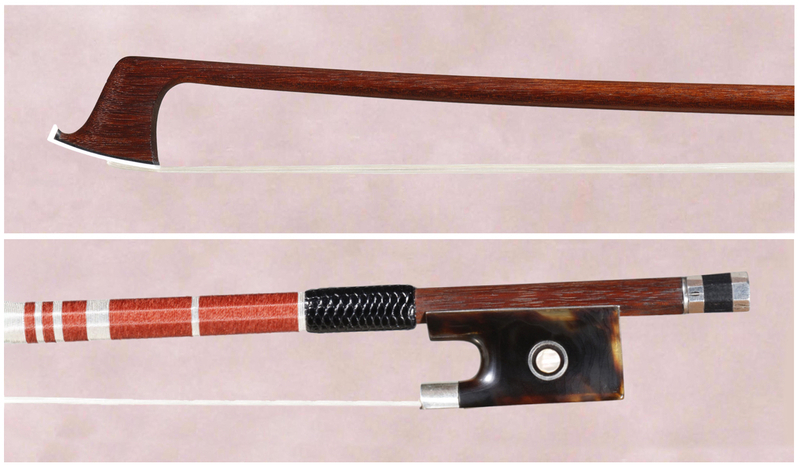 Made circa 1848–1851, these three magnificent bows are remarkably similar and are probably from a series of perhaps a dozen. They are of a quite dense and very dark red-brown Pernambuco which has both lateral striations and faint ringed figurations. At the same time the grain is very tight and straight. 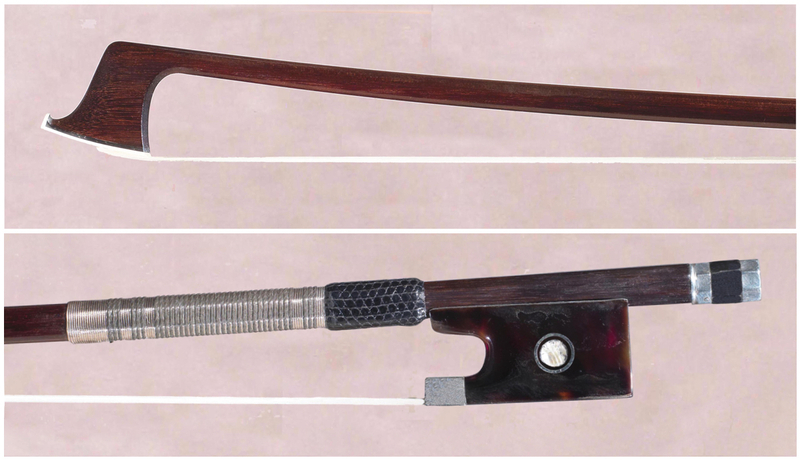 The sticks are masculine, almost overly full approaching the head, resulting in bows that are the essence of our concept of the Peccatte school, of which Simon is a prominent member. Their lengths are 72.4, 72.6 and 72.35 cm respectively, typical for Simon. For players, the bows are of heft with a balance favoring the head, but in general responding more quickly than the bows of the Tourte school makers. The heads are hatchet models, varying a little from one to another, but all powerful and statuesque. The chamfers are exactingly cut, tapering perfectly from the ‘comma’ at the head’s throat to their arrival at the head-plate, and mirroring each other to a fine degree. Almost no knife chatter is visible. The heads are full but not fat, in the best Simon tradition. The ridges make their way down from the heads’ crowns to the beaks in a precise, almost perfectly straight line. The modest beaks themselves complete the heads in perfect harmony. At the frog end of the stick, the brand-stamp is not seen in its typical location, but twice under the wrapping, on the top and bottom facets. It is the well-known ‘SIMON, PARIS’ brand. The frogs are all of a very dark tortoiseshell – one can see a bit of red or amber inside – perhaps in keeping with the very dark pernambuco. Otherwise, there is some variation in their modeling. The frog of bow number one, viewed in profile, is typical of Simon only in the slight inclination of its back towards the stick. The throat is quite open, the thumb projection smaller than typical. The small eye with a rather large circle is much like the frogs of Joseph Henry but, although Henry may have been there with Simon when this bow was made, the frog in its working mannerisms is very much a Simon. Simon and Henry (1823–1870) shared a workshop at 18, rue d’Angivilliers in 1848. They were at 179, rue St Honoré when they exhibited as ‘Simon and Henry’ at the 1851 Great Exhibition in London, where they were awarded an honorable mention. The nature of their working relationship is not known, but as Simon would have been 39 and Henry 24 in 1848, it’s easy to see who the senior partner must have been. The frogs of bows two and three are more typical of Simon. Their throats vary somewhat, but the eyes with their silver circles are what one would expect. Otherwise the frogs are exquisitely crafted – the ferrules’ corners gently rounded, the proportions of the rails to the pearl slide and small heel-plate well balanced, the iron screws affixing the underslide in typical Simon placement. The buttons are slightly conical and the three-piece proportion is the characteristic Simon one with the ebony center wider than the two silver rings, in contrast to Peccatte and Henry’s usual wider inner ring and narrower ebony center. The collars of the three bows vary a little but are modest and typical of Simon. The elements of each bow meld into wonderfully harmonious entities. These bows are presently in collections in diverse parts of the globe. An expert in French classical bow making, Paul Childs is author of ‘Jean Pierre Marie Persoit: His Life and Work’, among other publications.